Did you know: 89% of customers begin their buying process with a search inside of Google? Search Engine Optimisation is a minefield for most small businesses because of how difficult it can be to execute, and how long it can take to see real results. As we move further through 2016, and into 2017; Search Engine Optimisation has become more important than ever, especially if 89% of your potential customers begin their buying process with a search. If, as a small business you can utilise SEO to increase your sales, how would it affect your business online? An infographic created by Leapfroggr inspired me to write this article as I believe it is SO important to have an SEO strategy as well as an SEO checklist to follow as a small business selling online. Below I am going to be sharing with you the ultimate SEO checklist for any small business selling online, broken down into 4 key sections. Before you can fully utilise SEO for your small business, you need to take on the important task of Research. The research part of your SEO checklist can be broken down into 5 sections; market research, niche research, competitor research, keyword research and data gathering. Market Research: Your market research will give you an idea of what’s happening in your industry in real-time. Niche Research: Your niche research is where you narrow it down to your particular niche sector. This is where you will look at the landscape, and what Google will show you when you search using key industry terms. Knowing what shows up when you search local, will help you prioritise what you need to do to get on the first page of Google. Competitor Research: Who are you competing against with your product/service and what are THEY doing online, and how are they performing? Create an excel spreadsheet of your competitors and gather data based on their website, how they use SEO and their social media. Keyword Research: After doing your competitor research, you then do your keyword research as it’s important that you know what keywords your competitors are using online as if it’s working for them, it might just work for you too. Use their SEO strategy as a guideline for how you approach SEO for your business. This is where you can use Google’s Keyword Planner to compile a list of keywords you can use as part of your SEO. Data Gathering: You have done all the hard work of the research, but now it’s time to take everything you have found, and bring all your data into one place. Part of this is understanding where your business currently sits, and how you can improve it’s SEO. It is also important in the research phase that you use Google’s Webmaster Tools to see where the errors are on your website, whether you have broken links and where improvements can be made. On-page SEO has always been a huge part of my SEO checklist and strategy as I understand how key this is. If you have great on-page SEO, you can get a first page Google Ranking, if done properly. On-page SEO can be broken down into 4 sections; general, optimising content, performance changes and URL optimisation. General: This is where all of the basic on-page SEO should be looked at. Start with adding an XML sitemap, navigation, robots.txt file, an SEO plug-in for your website (I use Yoast) and fixing the webmaster tools. You should then look at the SEO for all of your web pages including meta tags, meta description and titles. Optimising Content: After you have gone through the “general” process, you then need to look at all of your existing content on your website. This is where you will make changes to your content. You should be looking at things like duplicate content, visual design, media useage, keywords, internal linking, bounce rate, CSS, outbound linking and new content. Performance Changes: You need to optimise your website to make sure it is mobile friendly, with good loading speed and hosting. Use tools such as Google PageSpeed Insights and WP Rocket (for WordPress). URL Optimisation: Having a good URL structure will impact your rankings, and how your users will be able to recall your content. Aim for below 100 characters with your URL’s, use 301 redirects where necessary and use your keywords to define your content. Off-page SEO is referred to as the most “popular” part of SEO work. This is otherwise known as link building. 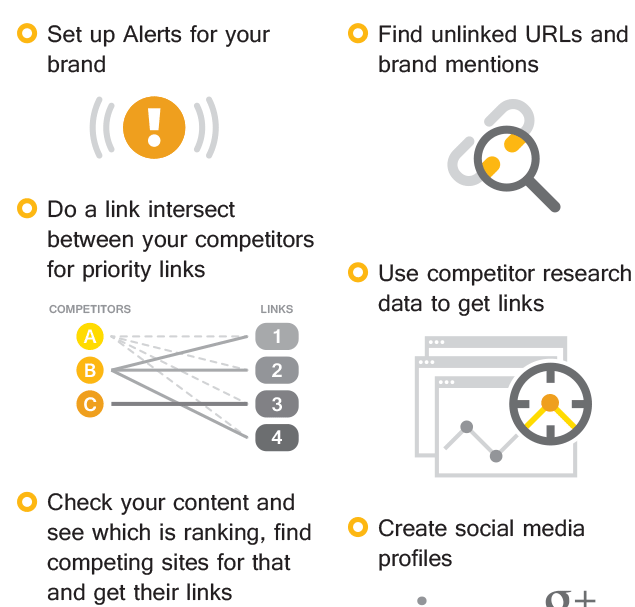 Here are a few ways you can optimise your off-page SEO. Brand Alerts: Do you want to know when someone mentions you or your business online? Set up brand alerts using Google Alerts or Mention. Social Media: Use your social media accounts as links under keywords in your content. This will not only help with your link building, but also growing your social media audience. Broken Link Building: Go back through your website and find the URL’s that go to a broken link, so that you can replace that link. Guest Blogging: I contribute to Social Media Today, and Business2Community. Doing this, allows me to link to content I wrote on both of the publishing platforms. Guest Podcasting: Do your research and find influential podcasters in your industry, collaborate with them and link their website in your content. LinkedIn Pulse: Every blog I write will be submitted to LinkedIn Pulse. I have had over 11,000 views on just one of my articles alone. Speaking/Conference Links: When I am talking at an event, tradeshow or conference, I will always use links to that event throughout my website. Infographic Links: At the end of this article, I have linked back to the original Infographic that inspired me to write this. You have made the cake, and now you just need to put the icing on top. Whilst “everything else” may seem vague, you can see via the image below, how important some of the actions in this penultimate step are. To help you with your SEO, please download my SEO research document, and Keyword metadata document here. I hope the above will help you create your SEO checklist. To see the full infographic from Leapfroggr, please click here. If you don’t know HOW to get started with your SEO Research, I have a completely free of charge download available below which will help you do this!